Not So Plain Jayne: Summertime and the livin' is easy. Firstly I'd just like to point out how proud I am of these photos - I finally did it. I managed to look like a normal human being. Anyways, another day, another outfit! So despite it being September it's been anything but cold. So much so I wasn't really prepared for such weather. However when in doubt, always go Monochrome. Not only is it timeless, it's pretty easy to do! I feel this outfit gives off a very effortless boho vibe and really is great for this time of year. Now if you're a little wary about having your stomach on show then this layered crop top is definitely the one for you. 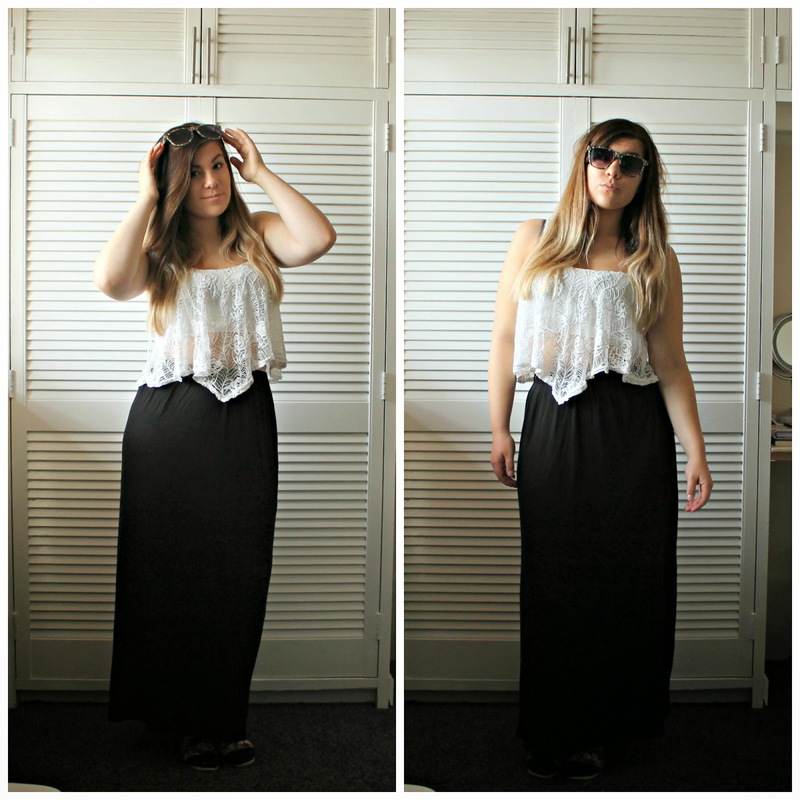 I got it from New Look last year and find it so flattering on my shape, The extra lace detailing over the top is perfect for hiding away the flab. Plus the rose detailing is super adorable. 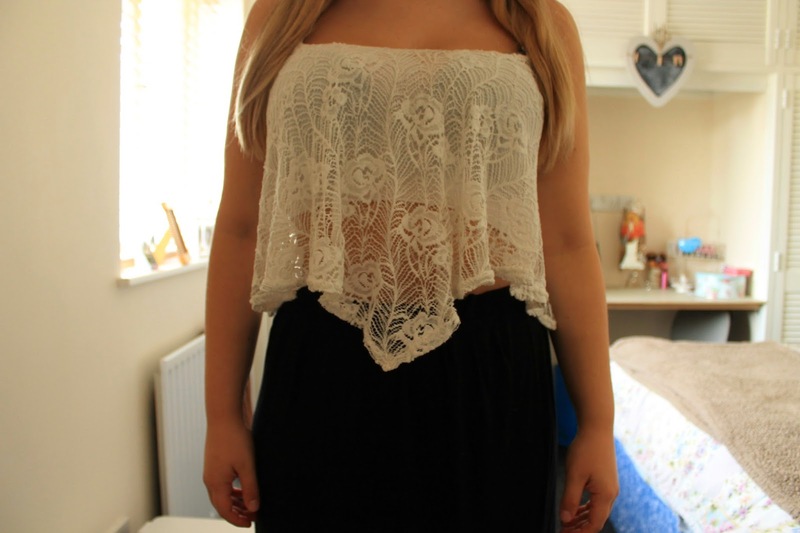 I actually loved this top so much I bought it in the black too. No doubt that will turn up on here sooner or later! 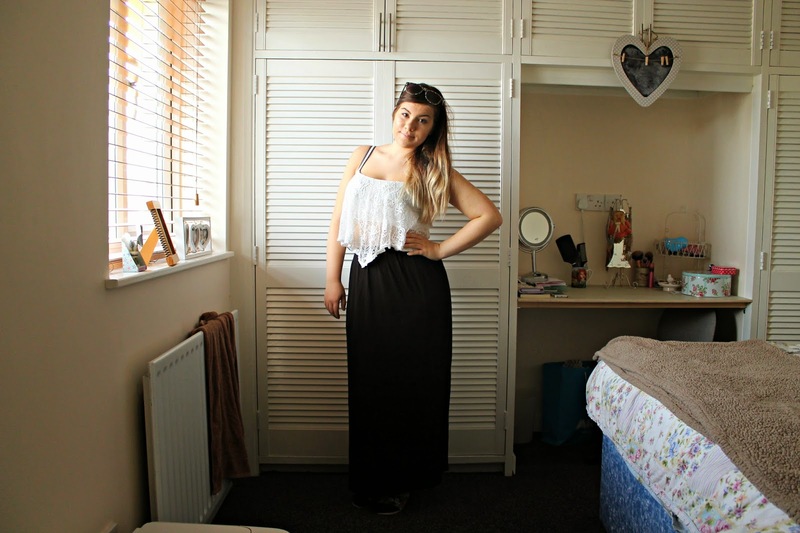 Maxi skirts are great for those days when it's warm but breezy - as there's no risk of anybody getting an unexpected eye full, Not to mention they're really comfortable. The only downside is if you're on the short side then walking up stairs can be a bit of a nightmare. I feel that the black really helps to slim down the appearance of my large hips and this paired with the white lace top is a match made in heaven. For a pop of colour I put on my pink floral patterned plimsolls. Coincidentally my sunglasses also had the same colour scheme going on. To tie in with this I put on a slick of my favourite hot pink lipstick and I was good to go! How do you feel about Monochrome? Let me know in the comments!